This national network is hosted by the Tecnológico de Monterrey (ITESM) and the National Autonomous University of Mexico (UNAM) and aims to bring together different actors in compliance with the 17 SDGs to make a social transformation and promote equity. On March 7, the SDSN launched its 32nd network, SDSN Mexico, in order to mobilize actions towards the fulfillment of the Sustainable Development Goals (SDGs) through partnerships between academia, government, companies, and social organizations. 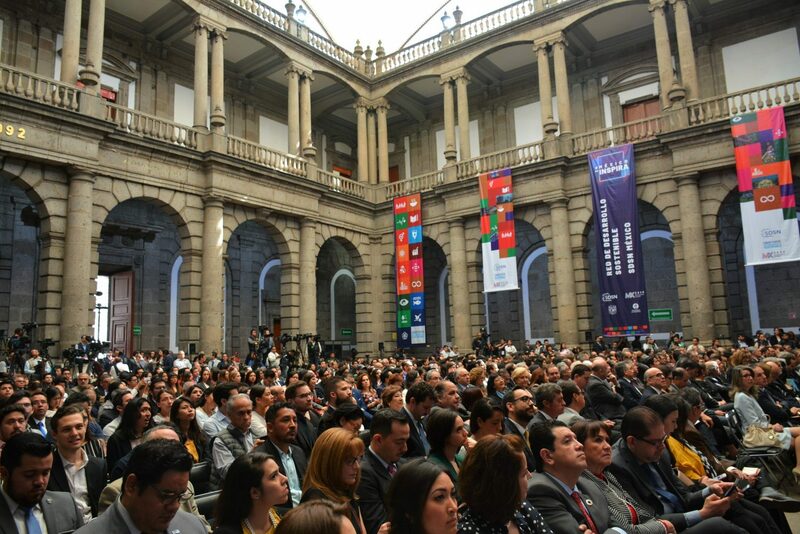 The official launch event in Mexico City was attended by 600 participants and boasted high-level participation from government, academia, and civil society, who all pointed towards the urgency to act in Mexico given the severe remaining challenges in most of the SDGs. Guillermo Torre Amione, Rector of TecSalud of ITESM, pointed out the fundamental role universities play in achieving the SDGs while at the same time, the Agenda 2030 offers great benefits for committed universities. Jaime Valls Esponda, Executive General Secretary of the National Association of Universities and Institutions of Higher Education (ANUIES), informed that the 195 member institutions of ANUIES have developed 3,171 multidisciplinary projects to contribute to achieving the SDGs, mainly in the areas of quality education, health, and well-being. The Undersecretary for Multilateral Affairs and Human Rights of the federal government, Martha Delgado, welcomed the initiative and assured that this moment represents an opportunity to advance in the fulfillment of the SDGs since, on the instructions of the President of the Republic, Andrés Manuel López Obrador, the National Development Plan, must be aligned with this road map. In addition, she recalled that the United Nations is currently working on the Development Assistance Framework Guidance (UNDAF) to establish the work plan of the UN agencies in Mexico and its collaboration with the federal government. Claudia Sheinbaum, Head of Government of Mexico City, explained that the 2030 Agenda is the foundation of the development plan of the capital and that her government will participate in the Network. Rector of the UNAM Enrique Graue called on universities, research centers, government agencies and the scientific community of the country to join efforts in the newly launched SDSN Mexico to generate holistic responses and achieve sustainable development by 2030. He recalled the commitment made by all UN member states in 2015 and the urgent need to create an environmentally, socially, and economically sustainable life, for all. “The aim is to move towards a development model that eradicates the devastating effects of overexploitation of natural resources; that promotes societies with social equity, without poverty, and with access to adequate nutrition, to quality education, to universal health services, and to decent jobs”. Finally, Alfonso Romo, Head of the Office of the Presidency of the Republic, indicated that all the priority programs of the federal government seek to embrace the Sustainable Development Goals for the year 2030, and celebrated the effort of the educational institutions in this area, because “if we want a country with sustainable development, that culture must be created from primary education onwards”. The following panel on successes and lessons learned so far in the implementation of the 2030 Agenda in Mexico counted on the participation of Amparo Martínez, Director of the National Institute of Ecology and Climate Change (INECC), stressing that in order to meet the targets for 2030, projects cannot be worked on without a holistic, inter-institutional vision and the participation of society. María José Céspedes, Director of Ashoka Mexico, Central America and the Caribbean, called for everyone to join the movement as agents of change, guaranteeing a better world in the future. Tania Rodríguez, Director of the Mexican chapter of Sistema B, highlighted that the private sector must be more involved in solving the country’s challenges, generating an intergenerational dialogue and being empathetic with its environment. Lastly, Jordi Tovilla of the think tank Tempus Analitica, highlighted an already initiated event on deep decarbonization in Mexico (Deep Decarbonization Pathways Project), stating that finding the relevant angle and providing the right solutions is a powerful tool of making science available to government officials and thus converting it into an actionable plan. 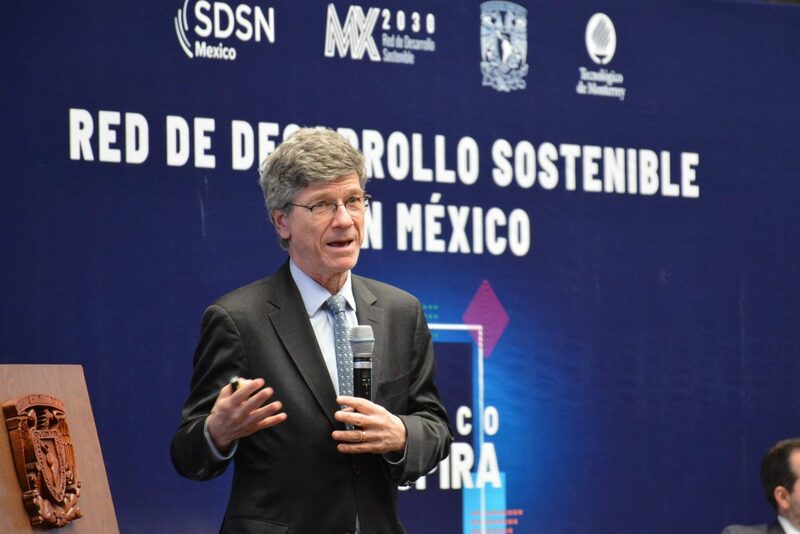 In his keynote speech, Prof. Jeffrey Sachs, Director of SDSN and Director of the Center for Sustainable Development at Columbia University, provided a detailed snapshot of the current sustainable development challenges in Mexico, pointing out the big opportunities the country has for solving them, particularly in renewable energy. Along the lines of the four main dimensions of evaluation, namely economic needs, social inclusion, environmental sustainability, and good governance, Prof Sachs explained how the country needs to move forward if it is to solve mayor challenges like education, innovation, inequality, corruption, and violence. SDSN Mexico joins the league of various recently launched networks in North and Latin America. With SDSN Canada, USA, the SDG Center for Latin America and the Caribbean, as well as other national and regional Networks in Latin America, SDSN Mexico is born into high regional coverage and a powerful set of allies in order to advance the work on the SDGs.